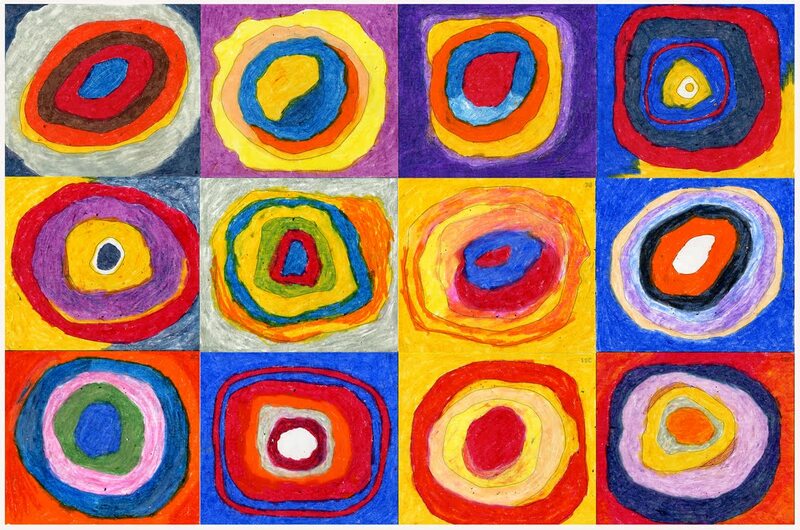 Our inspiration: Wassily Kandinsky’s circles. Day One of mural painting. For the last month, I’ve been facilitating the creation of a mural on the side of my garage. 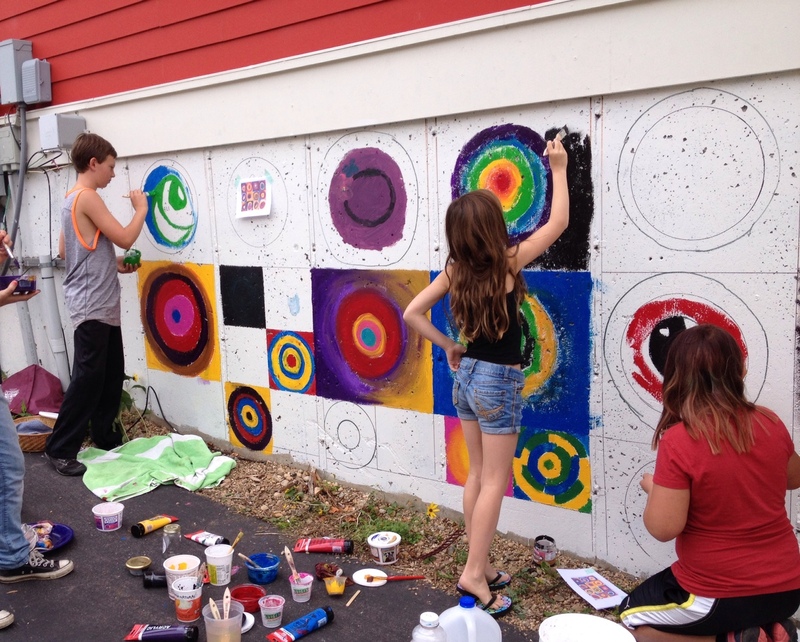 “Wild Circles,” based on a work by Wassily Kandinsky, is a series of (mostly) concentric circles painted by both children and adults living at Wild Sage, my cohousing neighborhood. Three non-Wild Sagers pitched in too. Over the weeks it progressed, I’ve spent a lot of time staring at the mural — trying to understand what works for me and what doesn’t, when I need to curate and when I need to let go. Unlike Kandinsky’s work, Wild Circles had over 20 artists take part, many of whom aren’t rule-followers. Is it more important to let the painters paint what they want or to coax them into following the rules for the sake of overall cohesion? Is okay to fill in spaces left blank because a child wanted to head off to their next temptation? Is it ethical to brighten muddy colors? And how does all this pondering spill into my own art and writing? In our neighborhood mural, some circles are rough and bold. Others are careful and precise. Some blend colors gorgeously. Others have rough planes of color. Two pairs of boxes call so much attention to themselves that they throw the large work off balance. Other sets of circles complement each other wonderfully. More than once, one person’s paint pushes into another person’s box. Some Wild Sagers painted two boxes. Many painted none. The mural is not exactly what I envisioned. I wish I could rearrange the squares like a sliding numbers game. Still it is colorful, captivating and in some spots, simply stunning. My favorite square was painted by a 3-year-old. 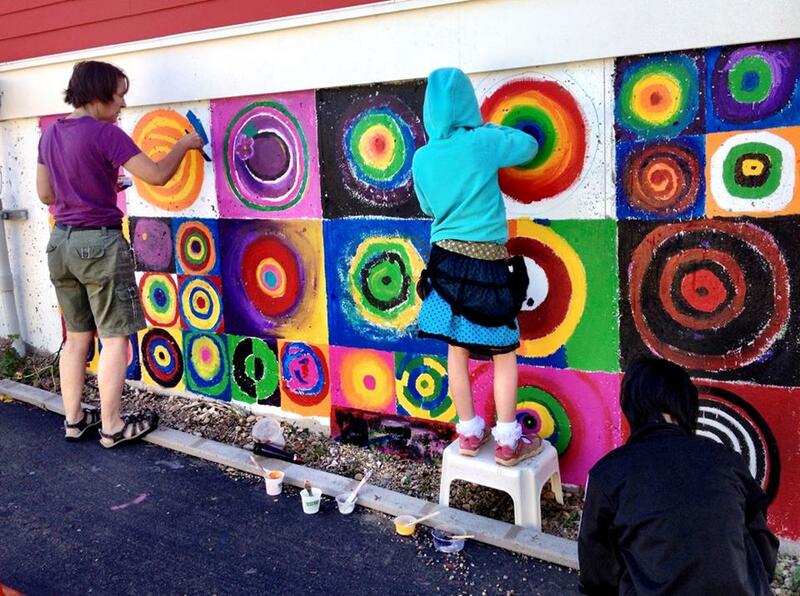 The Wild Circles mural–it’s bold, it’s messy, it’s delightful. It’s just like living in a cohousing neighborhood.